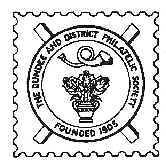 Dundee & District Philatelic Society held its Annual Dinner on Thursday 11th May at which a number of the members and their spouses attended. The dinner was held at the Invercarse Hotel in Dundee, and the evening soon warmed up with good food, drink and great company, and a good night was had by all. The Presidency of the society was handed over to the current Vice President David Millar. The Vice President's role was then taken up by Harry Jackson. Mark Lendon has been appointed as a committee member replacing Harry Jackson who has now taken up the post of Vice President. In the last display night of the season Vice President david Millar organised a Philatelic Miscellany night with himself, Doug Howkins and Mark Lendon providing the entertainment. Kicking off the evening David Millar stimulated discussion on the topic of e-Bay. David provided a presentation and demonstration, with a number of useful tips, on how e-Bay can be used for not just buying philatelic products but also for selling them. Doug Howkins followed this up with a slideshow of The Postal History of Spain from 1994 to 2007. Doug was prompted into doing this as he has been sent a lot of material from a friend in Spain and which needed to be put in some semblance of order, and thought this would be a useful way of achieving this. The slideshow contained examples of postal cancellations and usage for each of the intervening years, highlighting when the postal rates increased and containing commemorative, definitive and ATM stamps. Last up was Mark Lendon who provided an interesting display of how he uses imaging software on his computer to assist in creating albums of stamps with the images, providing examples of how to crop images, rotate them and also remove the background clutter to improve the image of an overprint. Thursday Nights' meeting saw local member Mark Lendon provide a display of Hungarian and Romanian stamps and covers with an emphasis on the region of Transylvania. For the second time ever at a society display Mark presented his display using a visual aid (namely, Powerpoint). Mark began the display by providing a short history of the relationship Transylvania has with Romania and the Kingdom of Hungary. His display consisted of a series of covers and stamps which all have a connection with three areas of Transylvania, Arad, Oradea and Cluj. Contained within the display were overprints of Arad issues which used obsolete Hungarian stamps. Mark pointed out the fact that there were around 50 different types of overprints used in these issues. Covers showing the postal history of Arad were also on show as were telephone forms showing receipts for phonecalls during the Austro-Hungarian period. One highlight on show amongst the WW1 censorship covers was a triple censored cover which contained Romanian, French and Serbian cancellations. On display were inverted overprints and postwar inflation covers from WW2. From the Cluj and Oradea areas were overprints from 1919 issues and stamps and postal history from the transitional period in Cluj when all Hungarian stamps were overprinted. Mark also pointed out that the Cluj overprints were always done using Capital letters whilst those from Oradea were done in lower case. Mark highlighted the fact that in this area of collecting there are a number of forgeries, mainly due to the amount of overprinting carried out. One postcard on display was actually made from beech wood as at the time they had run out of paper. As we all know Transylvania is associated with Vampires and most notably Dracula. In the photograph opposite Mark is being congratulated for his display by President Francis Podger who, not being superstitious, can be seen wearing a garland of Garlic. At last nights' meeting members and guests were entertained by a series of displays from four members of Stirling & District Philatelic Society. The picture opposite shows our guests from left to right, Donald Crawford, Bill Izzett, Richard Beith and Bill Troup. Donald started off the evening by presenting a display of covers which have some relevance to Scotland and which included a Robert Burns cover postmarked in Alloway, and a Russian cover portraying great literary figures, namely George Bernard Shaw and Robert Burns. One cover also had a house of Commons postmark. Also included in the display were some Australian and Czechoslovakian covers and a balloon cover sent from Switzerland to Sweden but which only got as far as Germany. Next up was Bill Izzett whose display titled "Scots wha care" consisted of covers and cards relating to school expeditions to Tanzania, Uganda and Israel. Covers consisted of some relating to David Livingstone and all covers reflected some aspect of Compassion, Injustice and Love. Richard Beith followed this with two displays the first of which was titled "Collar the Lot" which references a quote from Winston Churchill during the second world war concerning enemy aliens within the country. Approximately 30,000 enemy aliens were interned by the end of the war and some of these were transported to Canada and Australia. Richard's display consisted of censored mail from and to the internees. His second display was a set of postcards sent from members of the Prague Philharmonic Orchestra during their tour of Great Britain and Belgium in 1937 and 1938. Last up was Bill Troup whose display centred around the 1/2d green stamp of King Edward VII and King George V. Bill displayed different varieties of the stamps including colour changes, control marks, watermark varieties, various covers using the stamp and a number of production flaws. Members and guests were entertained on thursday night with a display of covers and cards from John Jackson FRPSL. John is a member of the Malaya Study Circle and his display was on the Netherlands East Indies (or Dutch East Indies as it is also known). John provided a very detailed and in-depth knowledge starting from the pre-stamp Napoleonic Era through to the present day. Post Agents were used in Penang and Singapore and relied on P&O to carry the mail. In 1878 postal agents were employed to handle the mail, whilst also using French mail Boats to carry the mail. John then proceeeded to break down the carriage of mail into three separate classifications, namely mail carried by Ship, Train and Plane. A number of covers were displayed showing straight line, oval and circular cancellations as well as a number of postcards depicting some of the ships used. John gave an in-depth description of the two different organisations which operated the mail routes namely, KPM and SMN and also displayed a couple of covers which had been dropped in the water at Genoa and recovered. Next on display were covers relating to the travelling post offices which operated in the area. John also informed the members that there were two different gauges operating at the time and a new line had to be built beside the narrow gauge one to connect the two areas. The evening finished up with a series of covers and postcards outlining the route between Holland and the Indies operated at the time by KLM. This also included Wartime Air Mails, German Internment Covers, Red Cross Labels and Japanese Occupation Mail which was for POW's in the Indies or where the Mail relating specifically to Dutch internees. At the end of the evening John was presented with a certificate by President Francis Podger, see opposite. Thursday nights' meeting saw 14 displays from members and guests of the society where an incredible 188 sheets were displayed. The range of displays covered all areas of philately such as Traditional, Revenue, Thematic, Social and Postal History. There were stamps from Norway, Nevis, New Zealand, North Korea, Nyasaland, Namibia, North Borneo, Nieu and Nicaragua as well as the tenuous links of stamps from India relating to states beginning with 'N' as well as depicting Prime Minister 'Nehru'. There were covers with Neo-post meter marks, and Scottish circular handstamps for towns beginning with 'N'. Another display covered 'Jan Van Riebeeks "Dromedaris" South African Penny Ship Stamp, showing all different varieties of the stamp. We were also treated to a couple of displays, one of which was titled "No" Losers here which was a display of Olympic medalists, European, World and FA Cup Football stamps. Another display was of "Naughty & Nice" postcards. Included in the evenings displays was a display from two guests of the society, Sabine and Lynn - shown opposite' which was three sheets related to New Technology where two of the individuals were also Nobel Prize Winners. At the end of the evening members tucked into the usual fare of tea and cake which included an 'N' cake specially made for the occasion. In the third of his series of displays regarding 'Commerce in the Post' local Honorary member Ron Goodfellow displayed a series of covers and postcards on a variety of topics. He began with a series of postcards from a variety of countries on the subject of Health & Welfare and which consisted of postcards from Chemical Companies to Doctors regarding medicines. This was followed by picture postcards of ocean going liners where the postcards related to travel agents and shipping. These postcards were from a number of international steamship lines. e.g. The Aberdeen, Leith and Clyde Shipping Co., Cunard White Star Line and the Royal Mail Steam Packet Co. These were followed by Railways and Travel by Air which included cards from companies such as the London and North Western Railway (LNWR) and the Caledonian Railway Co. The subject of financial and banking matters followed with a whole host of cards and covers from a number of different Insurance Companies and Banks. Ron finished his display with a number of covers and cards related to Importing and Exporting. Thus ended Part III. 'Coming Soon - Part IV'. At the end of the evening President Francis Podger formally presented the trophies to the winners of the Annual Competition which was held 2 weeks previously. At the first meeting of the new calendar year 14 hardy souls braved the cold weather to attend the society's Annual Competition night. As usual 4 trophies were available to be won. The Postal History shield was competed for by Charles Lloyd and David Easson. Charles Lloyd won with a display of a First Flight cover from Cape Town to London, posted in Nyasaland, where the plane carrying the cover crashed not once but twice. The other 3 shields were awarded to the exhibitors as there's were the only entries for those competitions. The Thematic Shield was won by Norman Kelso with a display of "The Flightless Birds of Antarctica" (Penguins). The National & General Shield was also won by Norman Kelso with a display of Canadian Artifact & Parliament Definitives. The Social History Shield was won by Harry Jackson with a display of covers covering German Inflation - Hyperinflation during 1916 - 1923. At the last meeting of the calendar year 12 members entered the annual one-sheet competition. The winning entry this year was 'Shipwreck mail from the SV Albatross on its way to Singapore' from Colin Rochester. Is this Philately of the future? In the second half of the evening members displayed their recent acquisitions. Indeed one member who shall remain nameless displayed acquisitions from as recent as that morning. A variety of topics were covered which included WWII Censored Mail from German East Africa, Belgian Congo, Rhodesian covers, WW1 civil censorship from Sierra Leone, currency exchange control covers from Greece, maritime disaster covers, Canadian revenue stamps and documents. One member displayed a variety of covers from James F Low (Engineers) in Dundee which were received from 27 different countries. A number of stamps were on show such as Hong Kong issues, German stamps from the province of Bavaria, stamps from Madeira, perfins from the Anglo Palestine Company, stamps & miniature sheets from South Africa. There were covers containing overprinted British Post Office stamps. One member displayed five covers all of which had been sent to people overseas and all of which had been returned as not known at this address. To round off the evening members tucked into the usual Christmas fare of cake and dumpling. Last night members were entertained by a display of German East Africa during World War I from Gordon Shepherd, a member of the Rhodesians Study Circle. Gordon provided a detailed history of the events which took place in a number of countries involved in the war in East Africa. One interesting fact which emerged was that the leader of the German forces, Von Lettow-Vorbeck, was unbeaten during any altercations which took place with the Allied forces. Gordon displayed a series of postcards which effectively covered the entire conflict from 1914 right through to 1918. Indeed the German forces in German East Africa only surrendered 2 weeks after the armistice as they were unaware this had taken place. Local tribes provided the portering and manpower during the war and approx 100,000 porters died which amounted to 20% of their number. The main transport in the area were 3 railway lines, Mombasa to Lake Victoria, which was called the 'Lunatic Express', the Northern Line running from Tanga to Mt. Kilimanjaro, and the Central Line running from Dar es Salaam to Lake Tanganyika. The war was also fought in the Indian Ocean where the German warship 'Konigsberg' inflicted substantial damage to allied shipping. The Konigsberg relied on coal so was eventually disabled and scuttled when the British forces stopped the supply of coal ships. The german navy also reigned supreme on Lake Tanganyika until Britain managed to transport 2 boats to the area. This was achieved by sending them by train to the Belgian Congo where they were then loaded onto carts and transported through the jungle. the Germans were taken totally by surprise and lost their naval superiority on the lake. Two members of Falkirk & District Philatelic Society, Ian Anderson and Jim Morrison, entertained members on Thursday with a series of displays. Ian began with a display titled 'The Life & Times of King Edward VIII'. As the King reigned for less than 1 year before abdicating this provided few opportunities for countries to issue stamps. Ian's display consisted of stamps issued by Newfoundland and the only set issued by GB. Included were essays of the newfoundland stamps and trial stamps produced for GB prior to the actual stamps issued. Also on display were cylinder blocks, booklets, and covers related to the King and Wallace Simpson. Ian's second display was a set of GB miniature sheets issued in the last 3 years which consisted of stamps not part of the actual commemorative issues. Jim Morrison firstly displayed stamps, covers and booklets related to Hong Kong between the years of 1937 and 1985. The sets of definitives on display contained a number of variations of colour and watermark. Included was a 1/- booklet which was issued experimentally using a razor blade dispensing machine. Jim's second display consisted of early QEII issues for commonwealth countries alphabetically from Aden to the Cayman Islands. Members and visitors who attended this meeting were entertained by Sheila Den from Aberdeen Philatelic Society who provided a display of stamps and covers from Cuba. Sheila began the evening by providing a brief history of Cuba from its time as a Spanish Colony up until it gained its independence. The display consisted of stamps, covers and postcards all relating to Cuba, including the 3 years between 1899 and 1902 when it was under U.S. Administration. In the 1955 stamps a variety of colours and surcharges were on display as well as the Lindbergh stamp which ended up with a number of variations due to its having been rushed in to issue. Sheila also displayed a number of colour trial proofs which were never actually issued in these colours, including one for the Centenary of the Cuba Flag. Also on display were perfins on cover, cinderella stamps, anti-tuberculosis stamps, tax marks, clipper mail, cancellation marks, tobacco tax proofs and advertising labels. Much closer to home was a postcard which had been sent from Havana to a house in Ferry Road, Dundee. Members and visitors who attended this meeting were entertained by three members of Arbroath Stamp & Postcard Club. Starting off the evening was George Taylor with a display of Famous Scots on stamps which included some weel kent names such as Robert Burns, Robert Louis Stevenston, Thomas Telford, Alexander Fleming and John Knox. This was followed up with a display of US Presidents by Ann Findlay who provided members with a wealth of facts, such as, President Grover Cleveland was the only President to serve two different terms in office, hence there being only 43 presidents on show, whist Barrack Obama is the 44th President. The youngest President was President Kennedy at 43 and the oldest was Ronald Reagan at 69. Ann also put up two small displays, one on the native American leader of the Shawnee tribe, Tecumseh, and the other display was on similarities between the assassinations of Lincoln and Kennedy. Brian Cargill ended the evening with a short display on Lighthouses. The first meeting of the new season was the President's display and this was on a topic of 'Stamps Issued and Used in Singapore for Revenue Purposes 1937-2012'. In a deviation from normal practice this display was presented using an overhead projector and followed up by allowing members to view the display. Francis presented a variety of documents containing revenue and impressed stamps such as Insurance and Life Assurance documents, Bills of Exchange and even cheques. Included were overprints of receipt duty from the Japanese occupation	of Singapore and documents from the British Military Administration. Francis also provided a synopsis of the development of Singapore from being a crown colony through to full independence, and explained the changes in the way revenues were charged with the changes to the stamps through the intervening years. To round off the evening members enjoyed the refreshments as can be seen opposite.